"We were sloppy and gave them a goal," said Dave Jones, "but I can't take anything away from them - it was their day. 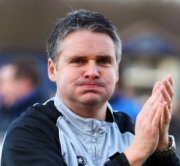 "We needed a shake-up because we had been a little bit lazy and lethargic and one or two needed to realise we were in a cup game - although it might have been a bit to do with the way Chasetown were playing themselves. "I'm not going to lie and say I wasn't concerned because I was concerned with the way we were playing, but I knew once we pulled our fingers out we would be fine. "Once we equalised and got control of the game it was always going to be a case of 'how many?' and I think you could see that Aaron Ramsey is going to be a real player. "This is what the romance of the FA Cup is all about and why it is the best competition in the world. "That's why there has been so much attention on it, because people are looking for a fairytale, but we've been the party poopers. "But we have been honoured to be a part of Chasetown's history. Their players were magnificent and they've taken just about taken everything they could away from our dressing room, shirts, boots, the lot!" Scholars manager Charlie Blakemore was a proud man. "It's been just an absolute dream the whole journey," he said. "I was really in dreamland when we scored. It was just a shame that we couldn't have held the lead through to half-time. They scored at a critical moment, it lifted Cardiff, you could see that. They stepped the game up in the second half on the back of that. But, crikey, I can be really proud of what we have achieved. "For a large part of the game we were still in it. In the second half, Cardiff were just passing for fun, but our lads just kept running and working. I'm the proudest man in the whole of the world today. My lads have just been awesome. To achieve what they've achieved throughout the Cup run has been out of this world."